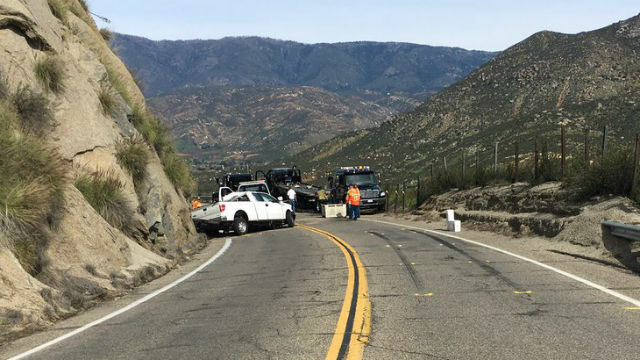 Three men were killed, another man suffered minor injuries and a fifth person fled on foot after a pickup crashed head-on into a tow truck Tuesday morning on a winding rural road near Harrah’s Resort Southern California. The collision occurred shortly after 6 a.m. on Valley Center Road, between North Lake Wohlford Road and Paradise Creek Lane, according to the California Highway Patrol. The tow truck was headed north when the southbound Ford F-150 veered into its path for unknown reasons, said CHP public-affairs Officer Mark Latulippe. Three men in the pickup were pronounced dead at the scene, the officer said. A fourth who had been riding in the front passenger seat of the F-150 ran away following the crash and was at large. Medics took the tow-truck driver to Palomar Medical Center for treatment of superficial injuries, Latulippe said. The wreck forced a complete closure of Valley Center Road at North Lake Wohlford Road, prompting the Highway Patrol to issue a traffic alert for the area. The roadway was open again in the early afternoon, the CHP advised.